Hope the new week is wonderful. Love a fresh start with each new week. Found this sweet Joy! Isn't she lovely. 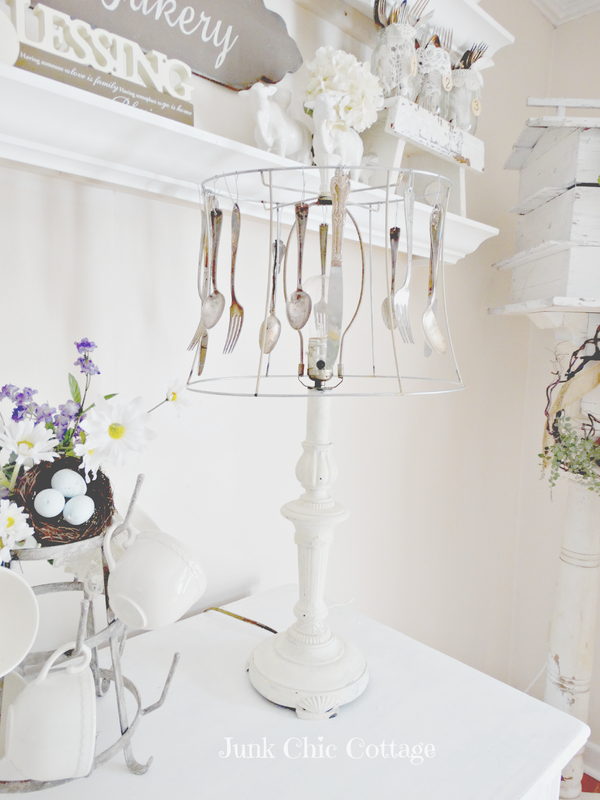 Vintage silverware hangs on the old lampshade and the base is ivory and chippy. Pure joy when I saw her. 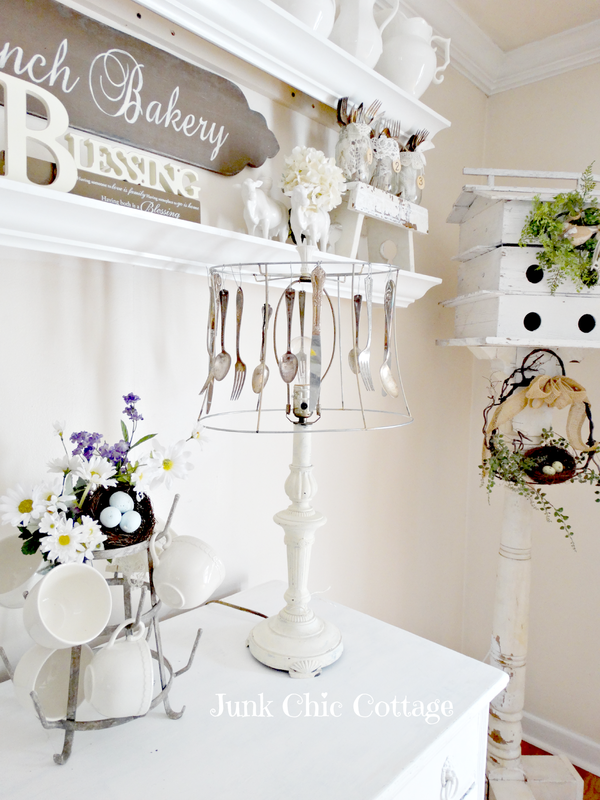 I love that she is near the mason jars with my old vintage silver I have been collecting. 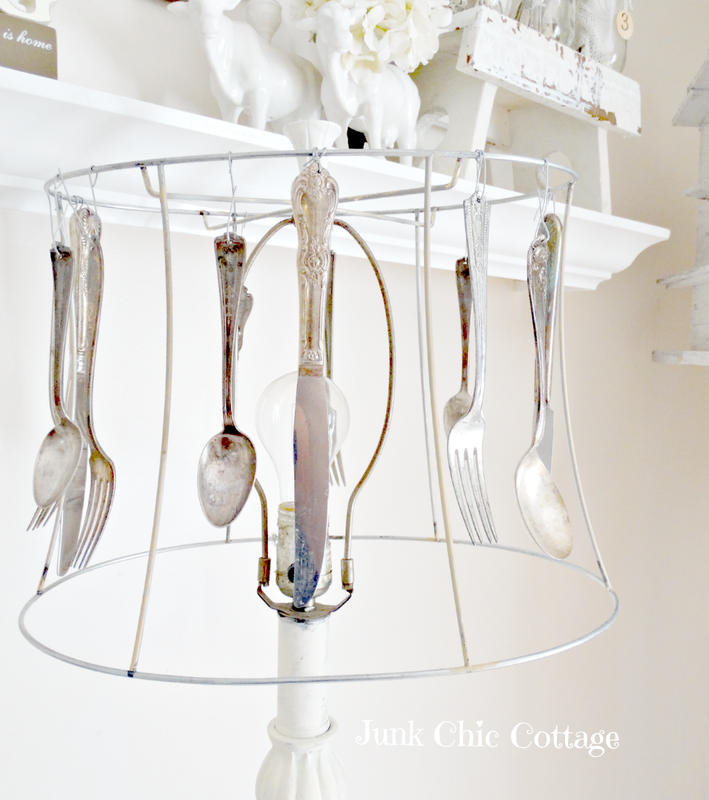 Love all the vintage and different silverware pieces. Each piece is different and has a beautiful pattern. So that is my new joy find from Friday. I am still tweaking in my dining room. It is fun to find new things and move around the things I have to get a new look. Have a great week. I am trying to enjoy these last few days of summer. LOVE, LOVE, LOVE your new piece and it look's terrific in your dining room! I especially love all of the different patterns. They are so gorgeous! That is the cutest lamp! I've never seen one like it before. That's truly one of a kind! I've always loved reimagined lamp shades like this one. The silver is so pretty! I made one myself, but with hanging wispy strips of white material and lace. Thanks for sharing and have a great week. LOVE! It is wonderful, Kris! Oh Kris the lamp is so much fun, I hope you've named her Ms. Joy! The Edison bulb will put her over the top adorably amazing. I think I noticed one in her. You lucky junkiń friend! 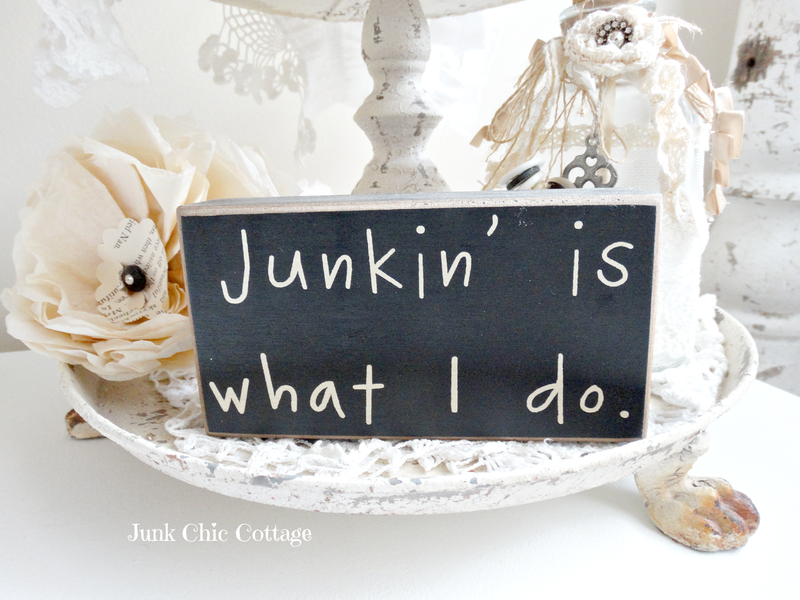 I also love the little blackboard sign! Such a darling idea! And what a fun way to use old silver. I can't seem to get enough. The weather is still lovely here, but it already feels so different. Once the calender turns, there will be no denying it! Well that is a pretty cool lamp shade girl! Love that sign too! That is too cute and definitely you. That lamp is so totally you, beautiful! I really like that lamp! Perfect in your home! That is just beautiful....I love it! What a wonderful find! So cute....love, love, love it!! The lamp has been a wonderful find, Kris. It looks great and you have some additional silverware in case you get more guests than you have flatware for ;). What a creative and unique find! Fits right in with your style Kris, you did good! I have a bunch of these shades. Cute idea! Kris I am loving this lamp, it is not different and one of a kind. Perfect for your home. Hi! I'm back from my vacation and i missed you. Great, great idea ! Your new lamp is fantastic, very charming and chic. oh, the shade is so very sweet! and it's just perfect for a dining room:) have a great day! Great find Kris, and perfect for you home! I can't believe you found Joy all prettied up like that, what a fun find. Oh I love it Kris! 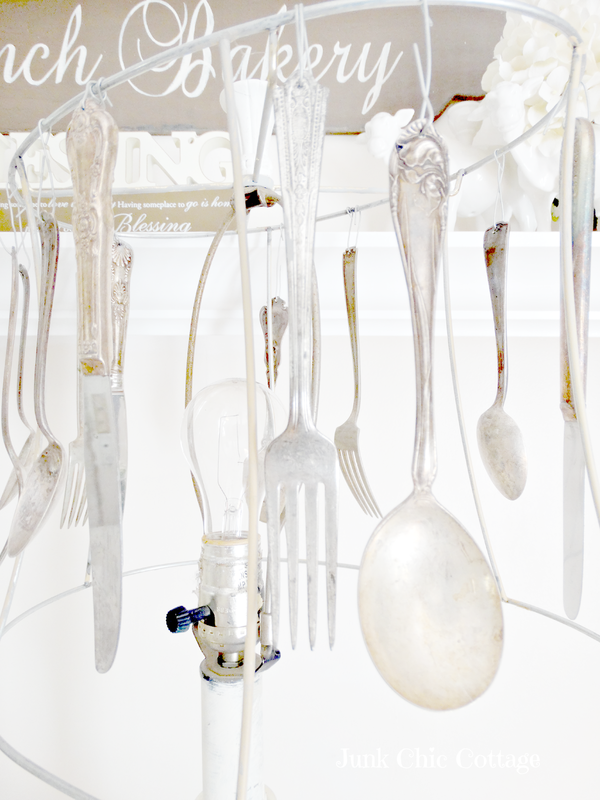 Vintage silverware is so fun. I pick it up when I run across it. I have a few pieces hanging from the chandy (that doesn't really light up) in our pergola. Yours is just too cute! You are so right...pure JOY...I would definitely smile with joy every time I passed by that lamp!! !...so beautiful and creative! Are you serious... it is just too cute! And you're right it looks adorable next to your laced ball jars filled with old silverware. I'm off to ARC Thrift Store, they have bins FULL of OLD silverware... I'm not to proud to dig!! I might even find a perfect lamp! You just find the BEST junk... if you can really call that junk! This is so cute, AND unique! I LOVE it! So very YOU, Kris!!! Perfect for your sweet home. Saturday Spotlight: Life Behind the Blogger.